San Marino | Restaurants of the World Unite! San Marino? That’s right: San chuffing Marino! Impressed? Jealous? Without boning up on Wikipedia (Mrs Del Monte dislikes me boning up around the house), here’s what I know for 100% sure about San Marino: It has probably never won Eurovision; the international football team has 11 players; and the San Mariner passport isn’t allowed through the EU lanes at immigration. Which I agree with. Keep those hordes of filthy San Marinese out of our pristine British Isles. All 11 of them. 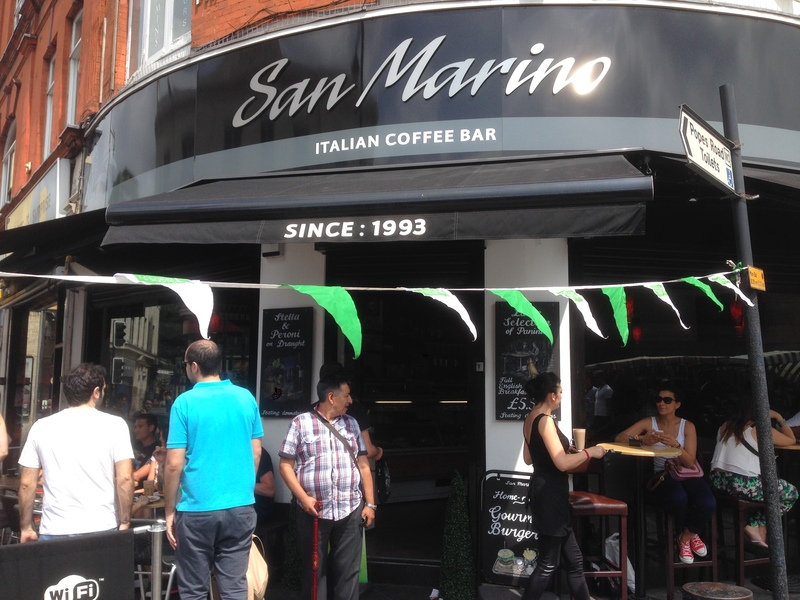 To say that San Marino in Brixton represents San Marinista cuisine is possibly a stretch. San Marino is nestled somewhere in Italy (nobody really knows exactly where) so can’t really avoid being heavily influenced. My guess is that they’re not diehard pie and mash fans. Anyway, I’ve satsified myself that it conforms to the strictures of the challenge and if you’ve got a problem with that then please forward me a postal order for £10. 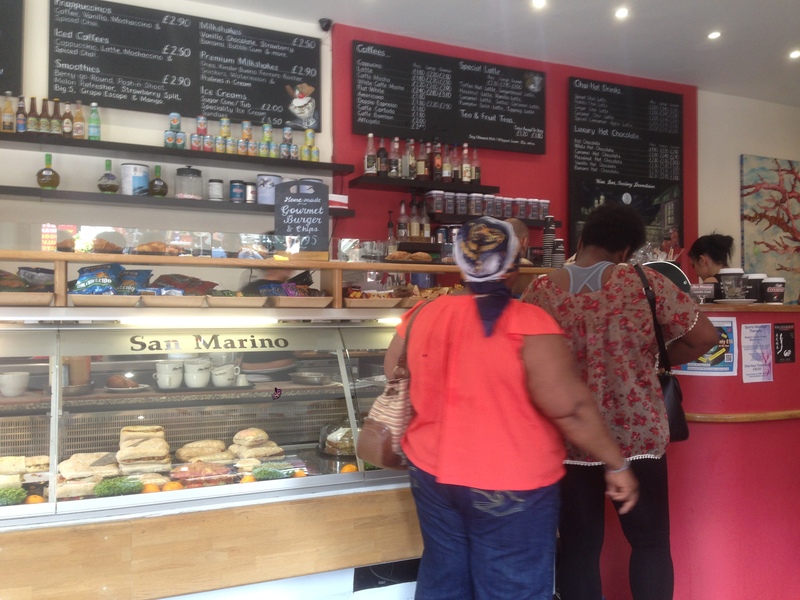 San Marino is a cafe where Mrs Del Monte used to get her Saturday morning coffee before I rescued her from South of the river and spinsterhood when I married her good and proper. 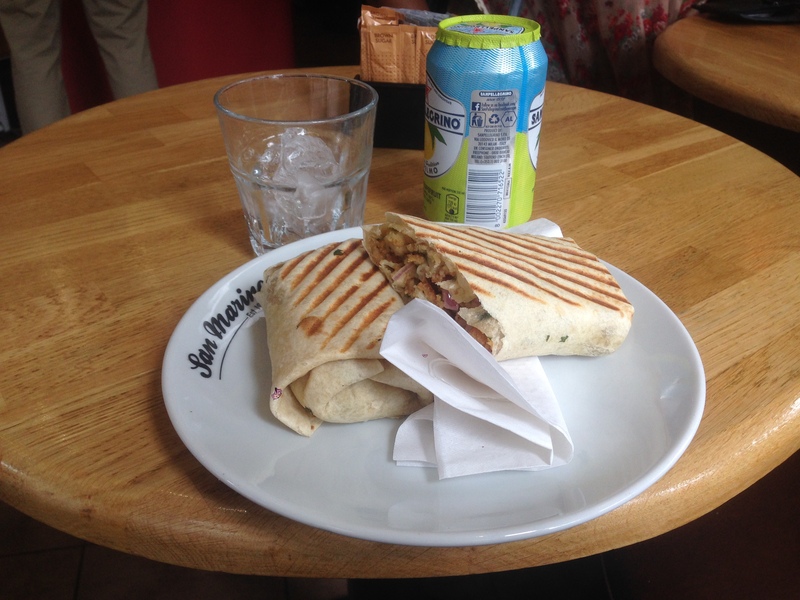 It also serves panini and my personal favourite: Piadine. The overseer is a Churchillian nonna surrounded by black-clad barristas who’d look more at home in a Bond villain’s submarine. I ordered a chicken escalope piadine and grapefruit San Pellegrino and wolfed it down, scalding my stupid non-heat-resistant mouth in the process and enjoyed the multi-strand bickering of the staff. It’s all in jest though I’m pretty sure Luigi now sleeps with the fishes. So don’t order the salmon. The Italians have taken the tortilla/kebab/wrap and improved it. Kudos. Delicious kudos. Nothing indicates what is within the sandwiches. It’s a delicious lottery. The two customers are concealing the nonna who looked like she’d threaten my life if pictured. Since 1993? The café can’t be older than the country it purports to represent can it?